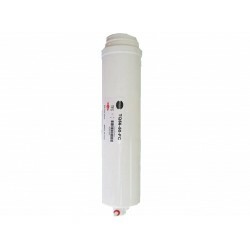 We stock a full range of Premium USA Omnipure Replacement Q Series 12 Inch Water Filters. The Q-Series is the ultimate “user friendly” inline filter on the market. Replacement of the spent media bed is completed , in a matter of seconds, by detaching the filter body from a permanent head with a twist of the wrist. The new filter body is just as easily threaded into the head, and the replacement is then complete. You are viewing our range of Omnipure Q-Series 12" x 2.5" replacement water filters. The Omnipure Q5605 Quick Change Water Filter is very "user friendly and hygenic" designed to be easily changed. This water filter suits omnipure quick change heads and some other brands. Replacement of the spent media bed is done quickly by detaching the filter body from a perma..
Omnipure Q5620 Q-Series Carbon Block Water Filter: The Omnipure Q5620 Block 1 Micron filter is very "user friendly". Replacement of the spent media bed is done quickly by detaching the filter body from a permanent head with a twist of the wrist. The new Q5620 filter body is just as ea..
Omnipure Q5633 Q-Series Coconut GAC Water Filter: The Omnipure Q5633 acid washed coconut GAC filter is very "user friendly". Replacement of the spent media bed is done quickly by detaching the filter body from a permanent head with a twist of the wrist. The new Q5633 filter body is ju..
Omnipure Q5640 Q-Series Coconut GAC Water Filter: The Omnipure Q5640 acid washed coconut GAC filter is very "user friendly". Replacement of the spent media bed is done quickly by detaching the filter body from a permanent head with a twist of the wrist. The new Q5640 filter body is jus.. The Omnipure Q5654 is a cation exchange softening cartridge which reduces hardness and scale deposits. This filter features the optional Twist Tap in-head valve system, which automatically turns the supply water off when the body is disconnected from the head. This filter can be used in ice makers, ..
Omnipure Q5655 Deionization Water Filter: The Omnipure Q5655 water filter is "user friendly".and can be used in ice makers, beverage equipment, drinking water fountains, RO systems, and under sink water filtration systems. Replacement of the spent media bed is done quickly by detaching the..
Osmotik Omnipure QR04 Reverse Osmosis Membrane 36GPD 12"
Osmotik HydROtwist HT4000 HT5000 TQ56-36FC Omnipure QRO4 Q5672 TQ56-36FC Reverse Osmosis Membrane Reduces barium, cadmium, chromium III & VI, copper, fluoride, lead, mercury, nitrate, nitrite, radium, selenium, and TDS. The RO membrane reduces a high percentage of dissolved inorganics. ..
Osmotik Hydrotwist QR04 Omnipure Reverse Osmosis Membrane 12"
Osmotik HydROtwist HT4000 HT5000 TQ56-50FC Omnipure QRO4 Q5672 Reverse Osmosis Membrane. 50 Gallons Per Day. Reduces barium, cadmium, chromium III & VI, copper, fluoride, lead, mercury, nitrate, nitrite, radium, selenium, and TDS. The RO membrane reduces a high percentage of dissolved ..